Over time, the consumption of staining agents such as coffee, tea, red wine, colas, or cigarettes can cause your teeth to become discolored and tarnished. This may lead to self-consciousness about your smile, preventing you from flashing it with confidence. Fortunately, teeth whitening can help you revitalize your smile, restoring teeth that are dazzling and bright. Teeth whitening is one of the most convenient and affordable cosmetic dentistry solutions available, and it can help you achieve a bright, beautiful smile. At Moore Family Dentistry, we offer in-office and at-home tooth whitening options, allowing you to choose the method that best works for you. To learn more about your options, please call (919) 772-1811 today to schedule a consultation at our Garner cosmetic dentistry office. Dr. Moore uses Zoom! in-office teeth whitening with all of his patients. He has chosen this system out of the many professional-grade tooth whitening options available due to the fact that Zoom! consistently achieves exceptional results. Zoom! uses the most advanced LED whitening technology to brighten your teeth without damaging your tooth structure. After making sure you’re a good candidate for the procedure, Dr. Moore will apply the hydrogen peroxide whitening gel. When activated by the Zoom! light, it will brighten your smile by as much as 8-10 shades. Your entire teeth whitening procedure can be completed in just one hour-long visit to our Garner cosmetic dentistry office. Dr. Moore will also give you free whitening trays to take home. Use these trays periodically as a touch-up to maintain your results even longer. Dr. Moore also offers at-home teeth whitening options for patients who prefer to brighten their teeth gradually in the comfort of their own home. 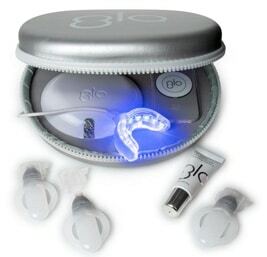 We use GLO Science Professional Teeth Whitening System which features a universally-sized mouthpiece that combines optimal warming heat and safe LED light to accelerate specially formulated 30% hydrogen peroxide whitening gel. Patients get lasting results without dehydration, rebound or zingers. It’s an effective, hassle-free procedure that is quick that can be done in the comfort of your own home! To learn more about your teeth whitening options, please contact Moore Family Dentistry today to schedule a consultation. Dr. Adam Moore serves patients in Garner and Cary, North Carolina.